by Susan E. Mead, H.M. In her first book, Susan Mead dishes on effective and cost-saving ways to stay healthy. 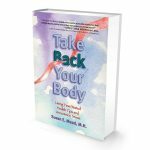 Take Back Your Body is loaded with practical health care ideas offered up in small bites of 500 words or less--about what you can read while sitting on the throne or waiting to pick up a child after soccer practice. Billions of dollars are spent each year by women and men seeking alternatives to expensive pharmaceuticals with negative side effects. With this book, the answers are at your fingertips--and the solution is often in your kitchen cupboard. Read what others are saying about Take Back Your Body. You rarely need drugs, gimmicks, or expensive medical treatments to heal your body. In this book, Susan guides you through releasing extra weight, lowering blood pressure, mitigating hot flashes, lessening allergy symptoms, reducing the need for antibiotics, listening to your body, and much more! Order your copy today and start saving on health care. Your body will thank you! Please note that there is an extra charge of $10 for all international shipments.